Opening Timing: 10am - 7pm everyday. Project Y is a public art and outreach project initiated by the Ministry of Culture, Hamburg, and carried out in the framework of “Germany and India 2011-2012: Infinite Opportunities”. It will be held in the cities of Delhi and Hamburg between October 16th and November 23rd, 2011, almost in parallel. The collaborative project is centered on the idea of creating ecological sustainable rivers in cities. Both the Elbe and the Yamuna are central to Hamburg’s and Delhi’s futures and there are various, very involved discussions around them, intensified by current challenges facing water issues. There is great public interest in the subject, even though the dialogues may be different in each place. It is expected to be one of the prime and most visible public projects during the project series “Germany and India 2011-2012”, and also coincides with the India week in Hamburg, celebrating Hamburg having been nominated as the European Green Capital 2011. The key component of the project will be public art projects on the banks of the river Yamuna in Delhi and the river Elbe in Hamburg. Two curators, Ravi Agarwal from Delhi and Till Krause with Nina Kalenbach from Hamburg, have been invited to co-curate the project. Ravi Agarwal is a well-acclaimed Indian artist and also a practicing environmentalist. Till Krause is a well know land artist from Hamburg who also runs an art-space. Acclaimed Indian and German artists have been invited to participate in producing on-site installations, which will be on show for two weeks in each city. They will deal with the discourse around the river. Each artist has conceptualized a work that highlights important issues related to the rivers – be they ecological, developmental, socio-cultural, or religious. In Delhi, the participating artists are Asim Waqif, Atul Bhalla, Gigi Scaria, and Sheba Chhachhi from India and Nana Petzet and Jochen Lempert from Germany, with contributions by Vivan Sundaram and Till Krause. In Hamburg, the participating artists are Atul Bhalla, Navjot Altaf, Ravi Agarwal, Sheba Chhachhi, and Vivan Sundaram from India and from Germany, Anna Möller, Jochen Lempert, Ines Lechleitner and many more artists from Germany and other countries. There will also be a Elbe/Yamuna show within an art exhibition at both places. The site has been carefully chosen as it gives an easy access to the river Yamuna, thus allowing maximum engagement with the river as well as both its banks. The power requirements of the project will be met by use of solar energy and eco-friendly fuel. All the material used by the artists to produce their works will be eco-friendly and most of it is also recycled material. Participating schools will include NDMC, MCD schools, private schools, NGO organizations for children such as Deepalaya, Kendriya / Sarvodaya Vidyalaya as well as schools from the German PASCH-network. 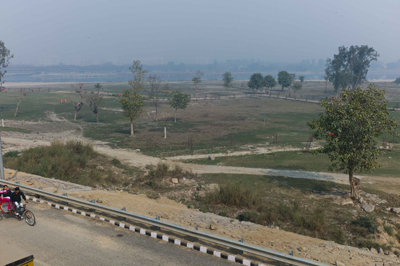 River Walks: Historians such as Sohail Hasmi and environmentalists such as Vimlendu Jha will conduct walks around the Yamuna as well as Delhi’s water systems to sensitize the general public as well as school children to their natural heritage and the impact of urban development on it. Public Discussions on subjects related to the river and the environment will also take place. Films and Musical Concerts: Films on the water and the Yamuna will be screened. A classical musical event will be organized by the river Yamuna. Toxics Link, World Wildlife Fund, Swechha, Foundation for Indian Contemporary Art, A Wall is a Screen, and several important historians and environmentalists in their individual capacity.